In the summer, it’s a common problem for commercial growers to have several sweet corn plantings all ready for harvest at the same time. When that happens, and there’s too much corn for your regular markets, what can you do? Drop the price to try to sell more volume, or disk in some perfectly good corn. Neither is a desirable option. The root of the problem. Early in the season, corn grows slowly. In fact, your first planting or two (early May in most Northeast locations) grow at a snail’s pace. Corn grows a much faster rate by the end of May and into June when the temperatures are higher. Even though growers know that early-season plantings need to be separated by a lot more time than subsequent plantings, it’s hard to time plantings just right, so they mature in a steady progression. The solution. Even though sweet corn varieties are labeled with certain ‘days to harvest’ what they really need is a certain amount of ‘heat to harvest.’ The way heat is measured in terms of crop growth is with Growing Degree Days, or GDD. You’ve probably heard about scheduling sweet corn plantings using GDD. Here’s how it works. Start with the reasonable assumption that when the temperature is below 50 degrees F sweet corn simply does not grow. (If you do nothing else, always measure the soil temperature before planting sweet corn early in the season, and do not plant until it is at least 50 degrees.) After planting a block of corn, if you add up all the heat that’s accumulated over 50 degrees, it’s possible to know how much your corn has grown, or not, and whether it’s time to plant another block, or not. Calculating GDD. It’s pretty easy to do. You record the high and low air temperature each day using a min/max thermometer. Add these together and divide by two, so you know the average temperature each day. From that, you subtract the 50 degree base temperature below which the crop doesn’t grow. What remains are the GDD for that day. Total up all the daily GDD after each planting and you will know how many GDD have accumulated. GDD = (daily high temperature + daily low temperature) divided by 2; minus 50. An example. Say you plant a block of a single sweet corn variety one Monday afternoon in early May. On Tuesday the high was 65 and low 45, so GDD=5. On Wednesday the high was 60 and low 40, GDD=0. On Thursday the high was 66 and the low was 42, GDD=4. Total so far is GDD= 9. Let’s say the weather stays like this, so after a week you have accumulated 20 GDD since planting. Is it time to plant a second block? No, and here’s why. Come harvest time in late July there will be about 20 GDD accumulating each day (with high temperatures around 80 degrees, lows around 60). So if you plant now, that second block will mature within one day of the first block, even though they were planted one week apart. You need to wait until about 80 GDD accumulate in order to have that second block ready to harvest 4 days after the first one is. If the cool spring weather keeps up, that could require waiting several weeks between plantings! Nice idea, but… This probably isn’t the first time you’ve heard about using GDD, yet for some reason you’re not using it. And you’re not alone. Seems like a lot of growers, especially on diversified farms where sweet corn is just one of many crops, are just too busy to keep up with daily temperature readings and such. So here’s an easier way to schedule your sweet corn plantings. Let your sweet corn do the work. Since corn plants develop in proportion to the number of accumulated GDD, you can simply keep an eye on their stage of growth to estimate degree days and decide if it’s time for your next planting. To do that, you need to know quite accurately what a corn plant looks like when a certain number of growing degree days has passed. Then, depending on how many varieties you sow with each planting, and the spread between the earliest and the latest among them, you can get a pretty good idea what stage of corn plant growth is a sign that it’s time to make a new planting. Simple cases. Let’s assume that you’re sowing one variety per block, and you want 4 to 5 days of harvest in August before the next block is ready. 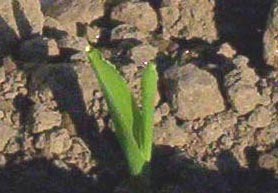 You plant, then keep a close eye on the corn it until it reaches the pre-spike stage, shown in the photo below. 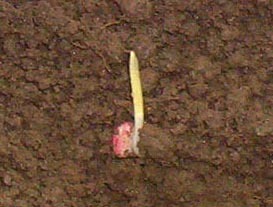 Note that this seedling has not yet emerged from the soil, but is just below ground. At this stage of growth about ~80 GDD have accumulated. It is time to plant your next block. Perhaps you sow two varieties per block, and they’re separated by 2 or 3 ‘days to harvest’ according to their descriptions. To maintain a continuous supply of corn in August you’ll need to plant another block when about half the corn plants in the block are in the ‘V stage’ shown below. 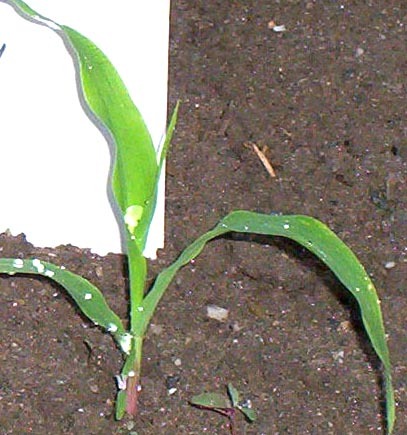 At this stage, the second leaf is emerging but still rolled up, indicating that about 120 GDD have accumulated. Let’s say you sow three varieties, and there’s a 7-day harvest period among them. An example of this would be using Mystique (75 days) Precious Gem (78 days) and Delectable (82 days) sown together in repeated plantings. 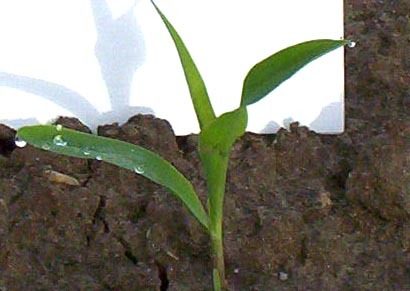 To secure a continuous supply of corn in August, you’ll need to sow another block when the average corn plant looks like the one below, with its third leaf emerged, starting to flatten out, but still rolled at the end, indicating that ~160 GDD have accumulated. If you had 4 varieties with 9 ‘days to harvest’ separating the earliest from the latest, to get a consistent supply of corn in August you’d plant a new block when about half the plants in the block have their forth leaf just emerged, but still standing straight up, as shown below, indicating that ~200 GDD have accumulated. These photos of plants as GDD indicators are only guidelines that you can use to get started with this method on your own farm. Depending on your location, and your combinations of varieties, you’ll have to adjust the stage of growth that you use as your critical GDD indicator for when to plant sequential blocks. But the point is: if you learn to ‘read’ them, your sweet corn plants can tell you when to schedule your plantings. Go slow, go fast, go slower. Remember that early plantings in May, when the weather is cool, may seem way too far apart. Plantings in June when the weather gets hot will seem awfully close together. Your latest plantings, meaning late June in most of New England, can be spaced further apart in time because they will have a longer harvest period when degree days during harvest are accumulating more slowly in September. Thanks to Hank Bissell, Lewis Creek Farm, Starksboro VT for his on-farm research that provided much of the information for this article. Published: September 2011. Revised April 2015.